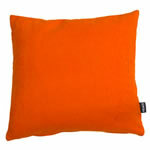 The most exciting, energetic and trendy colour of summer 2011 is orange. Designers have used this colour in their collections and, when combined with black and beige, can make versatile interiors decoration accessories. 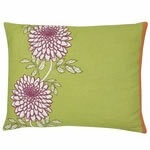 If you are not a fan of orange, then green is also very trendy and tends to goes very well with orange to create unique fabric combinations for your homemade doorstops, or to give some sparkles to your sofa with some vibrant colourful envelope cushions! We have mentioned numerous times in our previous articles, that floral prints are a hot new trend this summer and ticking stripes with floral prints always complement each other (although stripes are not as popular as floral). 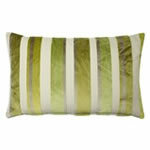 So mix and match the two fabrics to create deceptively simple square cushions for example! 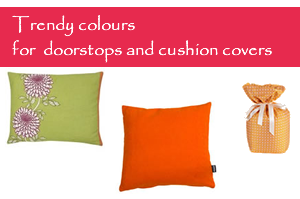 Below are a few examples to give you an idea of how to make your envelope cushion or doorstop using the latest trendy colours!